The Generation 2 EZee Fold Power Wheelchairs consist of two standard models, one with 8" rear wheels primarily for indoor and solid surface use and the other models with 12" rear wheels more for outdoor use. The CH4061 and CH4062 are heavier duty models with one piece footboards and black or gray frames respectively. 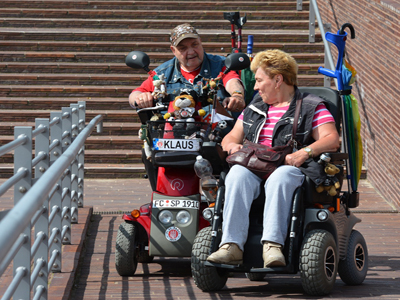 All EZee Fold models incorporate easy fold mechanisms for truly portable power wheelchairs that are ideal for traveling in a variety of cars and vans.